To optimize the performance of the PF-65ED/EDA 65mm ED Spotting Scopes, PENTAX has developed three compact, high-performance XF-series eyepieces, all featuring a bright, high-contrast image, an American-standard 31.7mm sleeve and focal lengths ideal for outdoor viewing and bird watching. 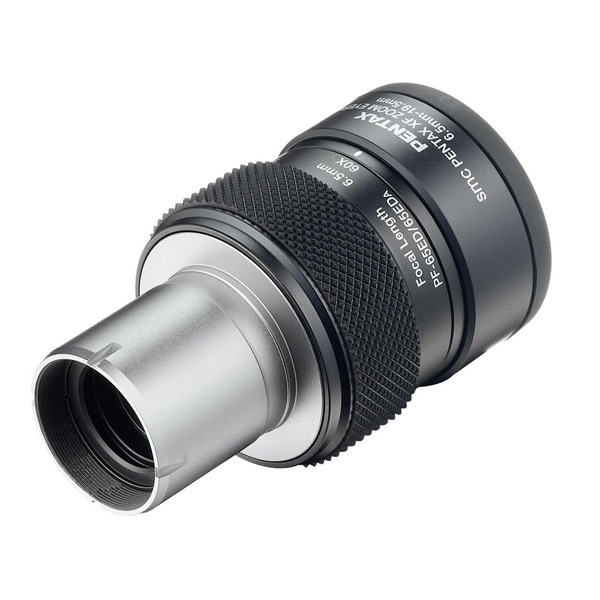 The smc PENTAX XF Zoom Eyepiece 6.5mm-19.5mm features a focal-length range of 6.5mm to 19.5mm for a magnification of 20 to 60 times, with an apparent field of view of 42 to 60 degrees and an eye relief of 11mm to 15mm. It also offers a user-friendly rubber eyepiece ring to minimize the risk of scratching the observer's eyeglasses.